In this session I talked about how I tell my stories visually. We discussed emotion, body language, facial expression and a visual storytelling method I use in Squish Rabbit: pictorial speech bubbles. In this activity I had the kids brainstorm what picture we could draw in the speech bubble to let a reader know that Squish is hungry. There were some great creative suggestions, including tacos, sushi, pancakes and guacamole. We also discussed what each food would tell us about the kind of rabbit Squish is (ie. sushi might tell us he is Japanese, or well travelled, or is quite adventurous for a small rabbit). 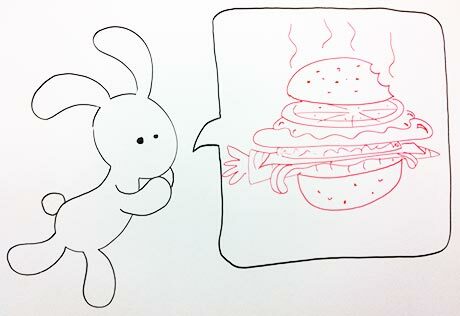 We then chose one food to draw together – in the above class we chose a burger and the kids suggested all kinds of things to fill it with (clearly, we had to sneak in a carrot). We then worked on making it look extra tasty so the reader would really empathise with Squish and feel his hunger – notice the smell wafting, the sesame seeds and the big bite mark. In this session I talked all about characterisation – how I create my characters, the research involved and the drawing process. I used the example of a picture book of mine called ‘Monster Music’, where I had to create a whole horde of little monsters. In coming up with the characters, I actually drew about 100 different monsters before deciding on which ones to use in the book. In order to make sure they all looked like they belonged together and ensure they weren’t too scary (the story is more playful) I ended up basing each character on an animal and then adapting it. After demonstrating this I got the class to choose an animal to base our monster on. The above class chose a bird, so together we brainstormed a couple of features unique to birds in which we’d keep – you can see they chose a beak, wings, feathers and claws. 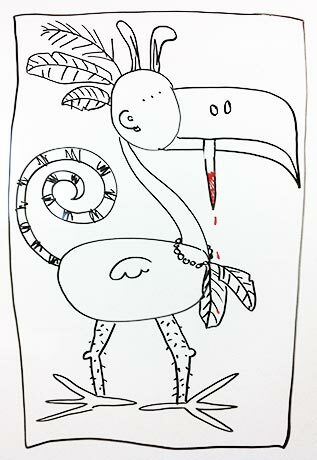 Next comes my favourite bit – we worked together to monster-ify our bird. The kids came up with all sorts of crazy ideas to make sure our character was really monster-like (the girls often want to keep their monsters cute, but the boys are quick to add fangs and blood). And did anyone notice the bunny ears on my monster? It actually wasn’t my idea! The kids were a blast, and I wish I could show you all the zany foods and monsters they created. Or maybe instead I’ll just borrow some of their clever ideas for my next book… mwa ha ha <evil artist laugh>.